Last week, my husband and I were in Burbank around lunch time, and we decided to break out of our rut (Porto’s, Market City Café, Chevy’s and IKEA are our usuals) and try a different spot for lunch. I remembered years back when I worked at Yahoo! 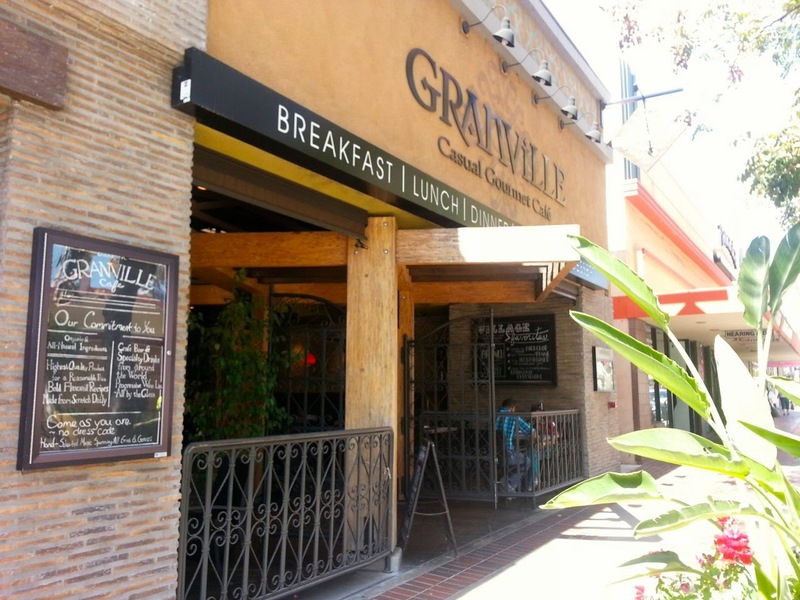 that some people went to Granville Café for lunch, so we decided to give it a try. Granville is located about a block away from Market City Café. We arrived just before noon and were lucky to get a parking spot right in front. One of the things I love about downtown Burbank is that the parking is free, but that doesn’t necessarily mean it’s easy to find a good parking spot…especially during the week of Spring Break. When we walked up to Granville, I was immediately impressed with the casual/rustic décor, yet it seemed classy at the same time. The hostess greeted us and asked us if we’d had their casual dining service before. We said “no.” She gave us menus and explained that we order at the counter and they’ll bring our food out to us. We joined the short line of customers and looked over our menus. A lot looked good. I thought about getting the Pastrami Sandwich or the Santa Barbara Chicken Sandwich; however, I wanted to eat something healthy, so in the end I ordered the El Gaucho Salad, which is described on the menu as “Fresh Organic Spring Greens, Queso Fresco, Grape Tomatoes, Jicama, Red Bell Peppers, Sliced Red Onion, Fresh Avocado, Spiced Tortilla Croutons and Pepitas tossed with Granville’s Chimichurri Vinaigrette.” I asked for the vinaigrette on the side and added all-natural chicken to the salad for a couple dollars extra. My husband went with his gut and ordered what sounded best, not what sounded healthiest. 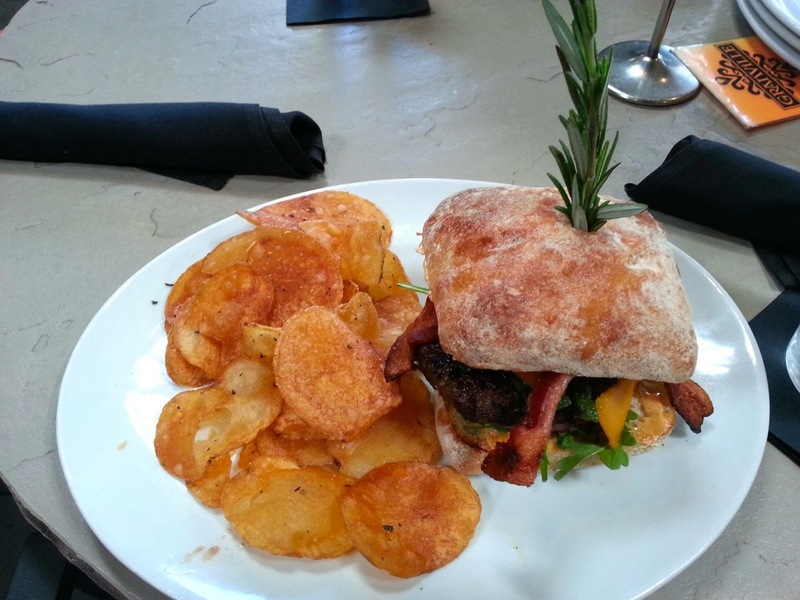 He ordered the Southwest Burger, which is described on the menu as “100% Fresh, All-Natural Angus Beef, Roasted Poblanos, Cheddar Cheese, Applewood Smoked Bacon, Red Onion, Organic Arugula and Granville's Chipotle Aioli on a Rustic Roll.” All sandwiches come with Housemade Herb Potato Chips, which are described on the menu as “Thick-Cut, sprinkled with Sea Salt and topped with Freshly Chopped Rosemary and Thyme.” You can upgrade to fries or sweet potato fries, but my husband decided to try the chips. We were given a number for our order, and then all we had to decide was where to sit. Considering it was lunchtime, I’m surprised it wasn’t more crowded. There were lots of tables available in all sections of the restaurant, and each section had a slightly different feel. 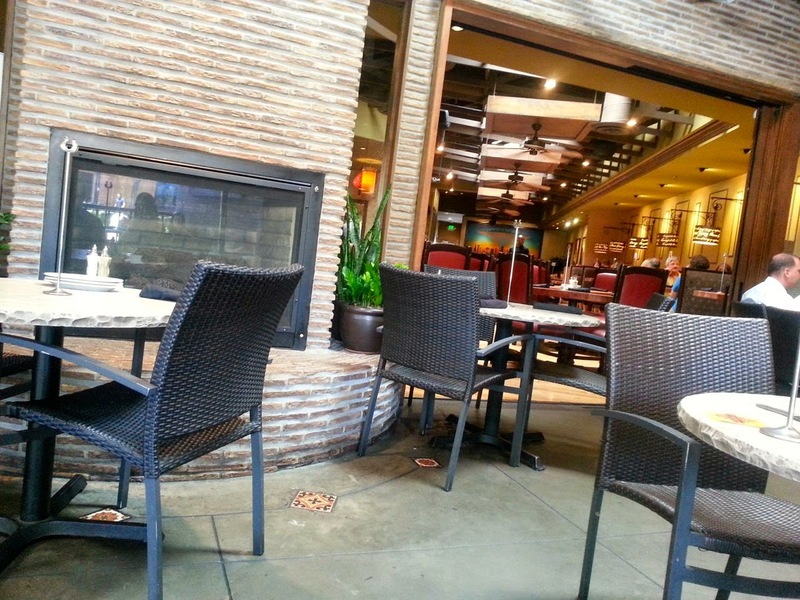 It was a beautiful day, so we decided to sit on the patio, which was completely covered and had a fireplace nearby. The music playing was relaxing, and the whole atmosphere was really mellow. Having not even tried the food yet, I decided that I’d come back here just for the atmosphere. It seemed like a great place to meet friends for lunch or dinner. When I walked to the back of the restaurant to find the restroom, I noticed that you can see directly into the kitchen. 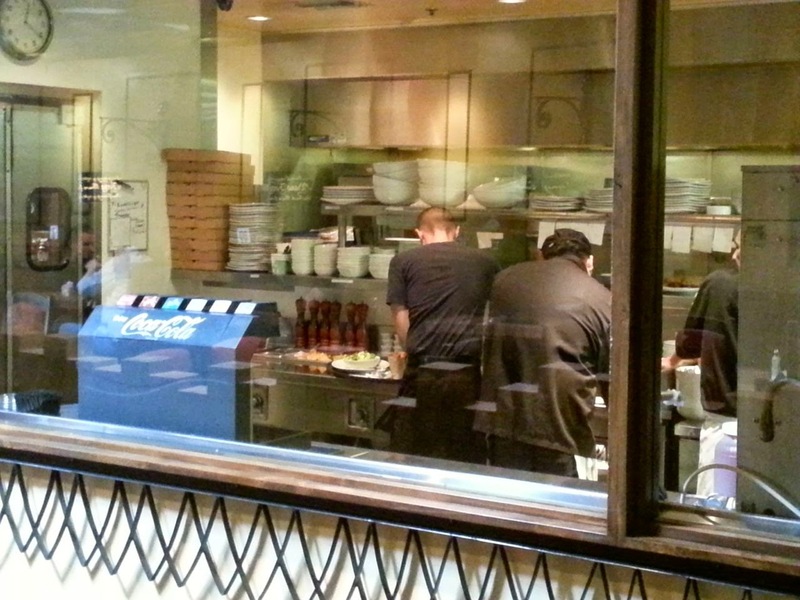 I love when restaurants have windows into the kitchen. It makes me feel like they have nothing to hide, and it makes my mouth water watching the food preparation. It didn’t take too long for our food to be delivered to our table. I was immediately impressed with the looks of both entrees. You can’t judge a book by its cover though, so taste would be the deciding factor. My salad tasted very fresh. The chicken was nice white-meat chicken with a delicious marinated flavor. The dressing was on the side as requested, and it complemented the salad well. No complaints. It was a big salad, and I actually started to get full about half-way through. It was delicious, so I finished it anyway. My salad was fresh and delicious, but my husband’s burger was, let’s just say, a first. Every time I blog about a burger I end up saying something along the lines of “it was good but not as good as the Kilauea Burger at Islands.” I took a bite of my husband’s burger 100% prepared to have the same comment. In fact, the comment went through my mind, but before I could say it out loud to my husband, I changed my mind. I think this is the first burger I’ve ever tasted that’s BETTER than the Kilauea Burger at Islands. The bun was delectable. The meat was juicy, flavorful and melted in your mouth. The roasted poblanos and chipotle aioli gave it a nice spicy kick. I could go on and on. 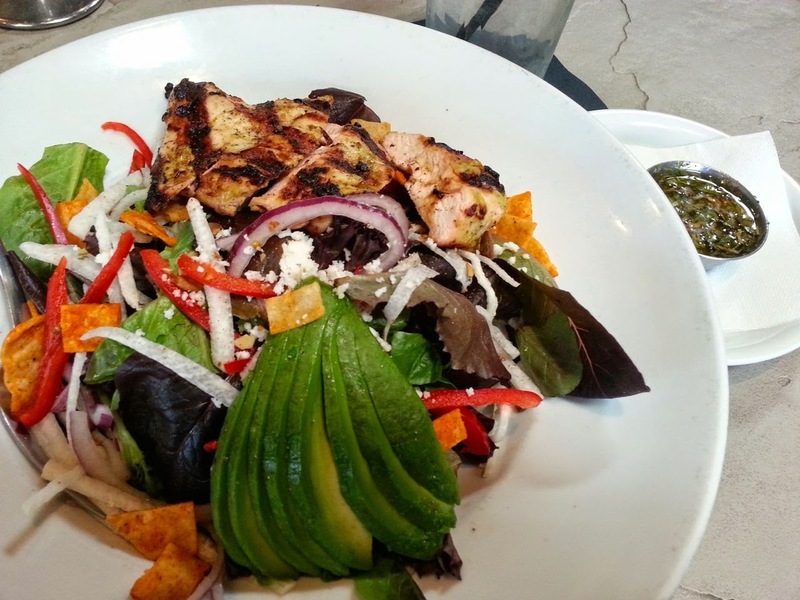 Add in the fact that everything at Granville is fresh, organic and made-from-scratch. I’m sure Islands can’t say the same. I have a new favorite burger, and it only took one bite to win me over. 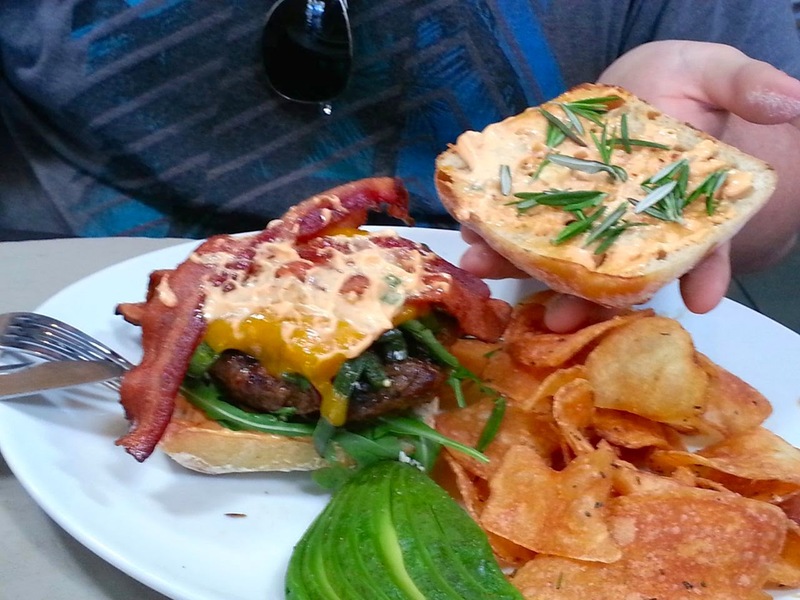 The only negative about the burger was that it was so big and juicy it was a little difficult for my husband to eat. It came with a stem of rosemary sticking out of the bun (super cute idea), and he broke off the rosemary and put it inside the bun. He also cut it in half, but it was still a juicy, messy challenge. He ended up eating half of it with a knife and fork just to make it easier. The housemade chips were delicious too. They had a great flavor and are much better than store bought chips. I highly recommend trying them when you come here. No need to upgrade to fries! I look forward to dining at Granville again sometime soon. I’m glad my husband and I tried two completely different entrees. They were both exceptional. Whether you want something healthy or something sinful, you can find it at Granville and know that it’ll taste fresh and delicious. I just might have to try the Pastrami Sandwich next time. I have yet to find a good pastrami sandwich in L.A., but I think Granville is probably up to the challenge! The menu’s description just convinces me even more: “Not for the faint of heart! Premium Pastrami slices layered with Roasted Poblano Peppers, Sun-Dried Tomatoes, Red Onions and melted Swiss Cheese, with Granville's Kalamata Tapenade Spread and Garlic Aioli.” It just might be better than what I remember eating in New York. Their Pastrami Sandwich is not of the deli type, more unique and boldly flavored, and it is amazing! Nice blog, Granville is a great place indeed.